Ashley Hall personifies a life transformed. Hall, 36, a native of Anderson, S.C., fell on hard times in 2010 during the recession when her then-husband’s contracting business ground to a halt. She needed help feeding her two young children. “When you’re in poverty, there’s a desperation that goes with that,” she said. So one day in 2010 she turned to Anderson Interfaith Ministry (AIM) and has felt the ministry’s comforting presence ever since. The group’s Women And Children Succeeding (WACS) program did more than feed her children; it helped equip her for a new life. AIM was founded by a coalition of churches in 1990 to help those struggling in Anderson, a city of 27,000 in northwest South Carolina. AIM stands for Accept. Inspire. Minister. That creed drives AIM’s work: operating a food pantry and emergency assistance program; helping the homeless secure stable housing and struggling homeowners avoid foreclosure; offering job counseling and training for the underemployed and unemployed; and providing young mothers with the tools they need to better themselves, vocationally and otherwise. Ashley Hall in her office at Clemson University in South Carolina. Hall takes a moment’s break from her busy job as a communications coordinator at Clemson University to put her gratitude into words. 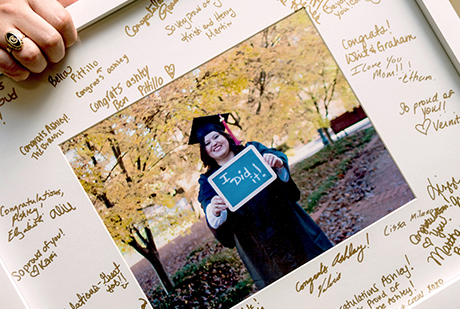 Moved by the support and determined to “pull ourselves up,” as she put it, Hall decided she needed more than the high school diploma she earned from Piedmont Christian Academy. She enrolled at Tri-County Technical College in Pendleton, S.C., and then transferred after two years to nearby Clemson University in 2012. Women And Children Succeeding helped Hall with child care and paid some of her bills. She benefited from parenting classes and guidance on how to write a resume and other practical skills. Her mentor, AIM volunteer Martha Burriss of Anderson, became a friend. When Hall’s car engine blew, AIM provided her with a car. Other offerings in Women And Children Succeeding include helping clients secure financial aid to pay for college. 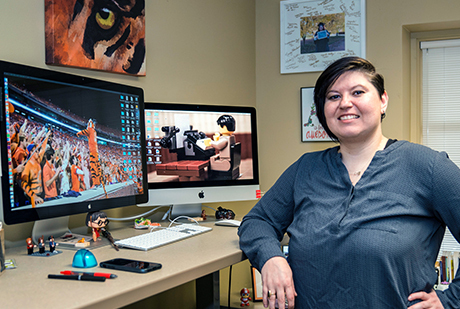 Today, she’s communications coordinator for Student Affairs Publications at Clemson, helping produce brochures, magazines and more for 12 departments. The desperate days, and that car with the blown engine, behind her, today she drives to and from work in a 2015 Chevrolet Equinox. And, yes, she roots for the Clemson Tigers national championship football team. King-Brock said AIM works with 3,000 families a year, with a $3 million annual budget built on donations and grants. The Duke Energy Foundation has long supported AIM and its efforts. Most recently, it provided a $35,000 grant for a program that creates a pool of skilled workers and helps clients gain the tools and training necessary to move out of poverty. Many of the clients are part of the WACS program, like Hall. King-Brock said the program has a positive impact not only on the participants, but also on the economy in Anderson. In all, the Duke Energy Foundation in 2016 provided more than $2.8 million in grants to nonprofits across its South Carolina service territory. If there’s one overriding lesson Ashley Hall has learned since she found AIM, it’s that life can turn on a dime, often through no fault of your own. Only now she knows she can turn to an organization that is helping women and children succeed.